For once, the Western Hockey League trade deadline delivered some blockbusters to rival all the insanity out east. The buyers were really buying and the sellers were really selling, but who were the winners and losers? The buyers or the sellers? Some combination of the two? Or those who stood pat amid the chaos? The contenders, for the most part, loaded up to make a run this season — both at the Ed Chynoweth Cup and the WHL’s second berth to the Memorial Cup tournament — while the rebuilders stocked up on top prospects and draft picks for years to come. Big names were on the move, including two defencemen from Canada’s world-junior team — one expected and the other something of a surprise. When the dust settled, 44 trades went down from Dec. 27, coming out of the holiday break, through the Jan. 10 deadline — involving 71 roster players, 13 prospects and 71 draft picks, including 17 first-rounders. Add it up and that’s 155 total assets over a two-week period (15 days) in a 22-team league. That’s a ton of activity, especially for the WHL — where GMs are generally more reserved than their counterparts in the Ontario Hockey League and, to a lesser degree, the Quebec Major Junior Hockey League. That’s not to label the WHL general managers as less ambitious but, by comparison, they have typically taken more of a draft-and-develop approach to team building and success. There has always been wheeling and dealing at this time of the year, just not to the extent and magnitude of 2018. This was unprecedented, playing out as a seller’s market with the many buyers eager to overpay for win-now upgrades. No draft picks were spared as sweetener for ringers, driving up the value of elite talents and sparking bidding wars for complementary players as well. Anything to perceivably put teams over the top. The sudden surge was due to an arm’s race in two of the WHL’s four divisions — the East and U.S. — and thanks to this being a Memorial Cup year for the league, with the Regina Pats hosting the 100th edition in May. As always, the host team gets an automatic entry and the league champion — or runner-up if the host wins the league title — also advances to the four-team tournament, along with the playoff champions from the Canadian Hockey League’s other two loops. That aforementioned second berth was the carrot dangling in front of every prospective buyer in the WHL and several of them decided it was time to sell the farm and go for broke. This is a WHL world gone mad. Crazy times. Regina had to go all-in this season — essentially every host does — but from Moose Jaw to Portland, Swift Current to Everett, this stretch run is going to be as intense as ever. And the second round of the playoffs is going to be absolute bedlam! There will be heavyweight tilts in three of the four divisions, with plenty of parity in B.C. and only the Central throwing in the towel. The true winners and losers won’t be determined until April and May — or years down the road — but here are a few of the likely candidates in each category. With nothing to lose, no chance of their season ending in the second round, John Paddock reeled in several big fish to greatly improve his roster. Regina picked on Saskatoon, plucking ove-age scorer Cameron Hebig and import defenceman Libor Hájek in separate trades, and also pulled a rabbit out of the hat by landing power forward Jesse Gabrielle from Prince George. Gabrielle, a Boston Bruins prospect, is returning to junior from the pro ranks — similar to Reid Gardiner arriving in Kelowna last year — and Hebig is fresh off signing a free-agent contract with the Edmonton Oilers, while Hájek was a standout at the World Juniors with the Czech Republic. The make-or-break acquisition for the Pats will be Ryan Kubic as their Memorial Cup goaltender. Time will tell whether he’s up for that challenge or whether Regina will be able to outscore the opposition. Jared Legien and Austin Pratt will definitely help with that offensive depth, while Aaron Hyman and Brady Pouteau were added to an overhauled defence corps. In the meantime, Paddock will do his best to develop chemistry with his new additions in hopes of a prolonged playoff run since no host team wants to sit on the sidelines for more than a month between meaningful games. Carter Hart is the league’s best goalie, by far, and Garry Davidson did his best to give Hart another championship send-off after already backstopping Canada to world-junior gold. Everett was a big buyer, making a total of five trades ahead of the deadline. 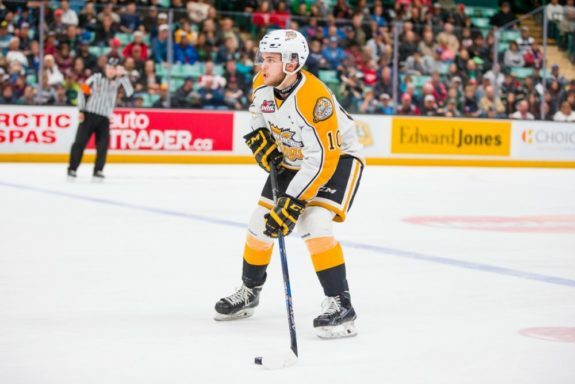 The biggest came with Kamloops, as the Silvertips acquired top scorer Garrett Pilon and top defenceman Ondrej Vala, another import with world-junior experience. Everett also added depth in the form of forwards Ethan O’Rourke (Prince George), Bronson Sharp (Portland) and Spencer Gerth (Victoria) as well as defenceman Jameson Murray (Calgary) — all in exchange for futures, without giving up a roster player in return. The Silvertips are deeper and better overall, but they will still only go as far as Hart can take them. Manny Viveiros has his finger on the pulse of the Broncos, as both general manager and head coach, so he knew what he needed to compete with the other beasts of the East. Viveiros made arguably the biggest, or at least the boldest, move on the eve of the deadline — raising the stakes by acquiring Lethbridge captain Giorgio Estephan and NHL-drafted goaltender Stuart Skinner as part of a 10-asset jaw-dropper on Jan. 9. Estephan should pair well with prior over-age acquisition Matteo Gennaro to give the Broncos a second wave of offence behind the league’s best line of Tyler Steenbergen, Aleksi Heponiemi and Glenn Gawdin. Viveiros also shored up his defence by prying Josh Anderson out of Prince George to give Swift Current a group that will defend first and foremost, while other contenders targeted offence from the back end. Skinner posted a shutout in his Broncos’ debut, so that bodes well, but he’s been inconsistent for much of the season and it’s debatable whether Skinner will be a significant upgrade on Logan Flodell come playoff time. There are question marks in goal for each of the big three teams in the East Division — Regina, Swift Current and Moose Jaw, which stuck with unheralded Brody Willms at the deadline. ICYMI: It was a night to remember for #Oilers prospect Stuart Skinner as he stopped 29 shots to shutout the Raiders in his debut with the Broncos. Swift Current’s additions of Tanner Nagel and Andrew Fyten, both gritty wingers, should pay dividends in the postseason, especially in that anticipated second-round slugfest. Moose Jaw Warriors — Alan Millar did the majority of his buying in advance of the deadline, but saved his best for last in landing Kale Clague from division rival Brandon. Clague is the league’s best defenceman, joining a healthy Josh Brook, top draft prospect Jett Woo, Russian imports Oleg Sosunov and Dmitri Zaitsev, and fellow deadline acquisition Brandon Schuldhaus on a stacked blue line in Moose Jaw. The Warriors’ forwards were already second to none in terms of depth. It may very well come down to goaltending and Skinner does inspire more confidence than Willms or Kubic. Kale Clague was the biggest name on the move at the WHL trade deadline, with the Moose Jaw Warriors pulling off the 11th-hour deal to land him from the Brandon Wheat Kings. Tri-City Americans — Jake Bean was expected to move, certainly more so than Clague, but Tri-City wasn’t considered a frontrunner for Bean. Most assumed Moose Jaw or Portland, but Bob Tory swooped in and snagged the best player available at the time of that deal on Jan. 6. Once that shoe dropped, business picked up across the league, but Tri-City didn’t make any more notable trades — only acquiring 17-year-old defenceman Austin King-Cunningham from Vancouver. The Americans are going to be dangerous if and when they get healthy, with top-line centre Michael Rasmussen and top defenceman Juuso Valimaki still a couple weeks away from returning. Tri-City looks good on paper, but not great in comparison to those top dogs from the East. Jake Bean, right, nearly made the NHL’s Carolina Hurricanes out of training camp this season and now he’ll try to make an immediate impact with the WHL’s Tri-City Americans in their quest to come out of the U.S. Division and the Western Conference. Portland Winterhawks — Make it four first-round NHL draft picks on Mike Johnston’s roster, adding Dennis Cholowski from Prince George to forwards Cody Glass and Kieffer Bellows and blueliner Henri Jokiharju. Cholowski and Jokiharju are very similar defenders, perhaps too similar in terms of playing style, but Johnston obviously believes there is no such thing as too much of a good thing. It worked out for Portland back in 2013-14 when Johnston added Matt Dumba to Derrick Pouliot and the Winterhawks went all the way to Game 7 of the league final (losing to Edmonton). Portland didn’t do much else this year and maybe missed out on one of the last-minute forwards, seeing as how Johnston parted with Sharp to Everett and Brad Ginnell to Kootenay while only adding Lukus MacKenzie from Red Deer — no relation to Skyler McKenzie, their surnames are spelled differently and Lukus is a big grinder instead of a small scorer like Skyler. Another of the latter could have helped too, but Portland might still be the favourite to win that hotly contested U.S. Division ahead of Everett, Tri-City, Spokane and Seattle. Prince George Cougars — Of all the sellers, Todd Harkins did the best in managing his assets and recouping a massive haul. This, despite trading away his son in the process. Even that move, packaging Jonas Harkins with Gabrielle to Regina, gave his son an opportunity to potentially play in front of hundreds of NHL scouts at this year’s Memorial Cup, though Jonas is not draft-eligible until 2019 and may not be a regular in the Pats’ lineup. Todd Harkins played his chips perfectly by dealing Gabrielle, Kody McDonald, Anderson and Cholowski in that order, upping the ante with each trade. Bidding wars broke out and Harkins reaped the benefits by maximizing his returns. Prince George wound up receiving 10 bantam draft picks — four first-round selections (2018 and 2019 from Swift Current, 2018 from Prince Albert and 2020 from Portland), two seconds, two thirds, a fifth and a conditional sixth — plus five prospects in forwards Kjell Kjemhus, Ethan Browne and Connor Bowie and defencemen Ethan McColm and Cameron MacPhee, and three promising young roster players in 17-year-old forward Ilijah Colina from Portland and 16-year-old defenceman Rhett Rhinehart from Prince Albert, along with 18-year-old blueliner Austin Crossley. Well played, Mr. Harkins. Commendable of Curtis Hunt to finally become a buyer instead of selling again, but this was the wrong year for the Raiders. Reality is, the big three in the East Division are far and away better than Prince Albert on paper. The Raiders stand no chance against Swift Current, Moose Jaw or Regina in a seven-game series, regardless of Ian Scott standing on his head. Prince Albert isn’t even in a playoff position at this point and would have to hope for the first wild-card spot to fall into the Central bracket and avoid sure demise in the East. Whoever gets that first wild-card spot — Regina has it now but may overtake Brandon for third in the division by season’s end — would have a decent chance at advancing to the the conference final by knocking off Medicine Hat in the first round and a seller in the second round, but that’s wishful thinking for Prince Albert. Hunt way overpaid for McDonald, giving up this year’s first-round pick, their first-rounder from 2016 in Rhinehart and a serviceable Crossley. McDonald has been a point-per-game player this season — he scored the overtime winner, his 20th goal of the campaign, in his Raiders’ debut — and will likely be back as an over-ager next season, but that was still a ridiculously steep price. The Raiders did better in getting Regan Nagy out of Victoria as an over-ager as well as a couple defencemen with upside in Jeremy Masella, again from Victoria in a separate trade, and Konrad Belcourt, from Kelowna. At the end of the day, Hunt didn’t do enough to be taken seriously this year and surrendered his first-round pick for an over-ager next year. Poor asset management, especially if the Raiders miss the playoffs again or make another first-round exit. There may have been some desperation involved given Prince Albert hasn’t made it out of the first round since 2005 and has failed to qualify in seven of the last 12 years, including 2017. The Raiders have won a combined four playoff games since 2005. That’s awful. Cam Hope could prove this theory wrong, but there is such a thing as too much tinkering. He was the league’s most active GM, trading like crazy all season long. By my count, the Royals have made 17 moves since August and a dozen since December. Hope has swapped out seven of his team’s forwards and also added two defencemen to the roster among those deals. Gone are Nagy, Legien, Jared Dmytriw, Ryan Peckford, Eric Florchuk, Gerth and Blake Bargar up front, replaced by Tanner Kaspick, Noah Gregor, Lane Zablocki, Jeff de Wit, Braydon Buziak, Andrei Grishakov and D-Jay Jerome. Jared Freadrich and Kade Jensen have solidified the back end in place of Anthony Bishop and Masella. All in all, the Royals should be a better team because of these moves — certainly a harder team to play against — and Hope didn’t have to overpay for most of his acquisitions. He essentially traded Florchuk for Kaspick, flipping the two first-round picks he got from Saskatoon to Brandon. Hope also chose to keep Jensen over Nagy among Victoria’s three over-agers, along with NHL prospects Tyler Soy (forward) and Chaz Reddekopp (defenceman). That’s a ton of turnover for a team that was in first place for much of the first half, but Victoria obviously wasn’t happy with its makeup in deciding to overhaul this roster on the fly. The next few months will be telling as to whether all this movement was worth it for Hope and the Royals. From too many trades to not enough, Bruce Hamilton was relatively quiet at this year’s deadline — the quietest of the legitimate contenders. 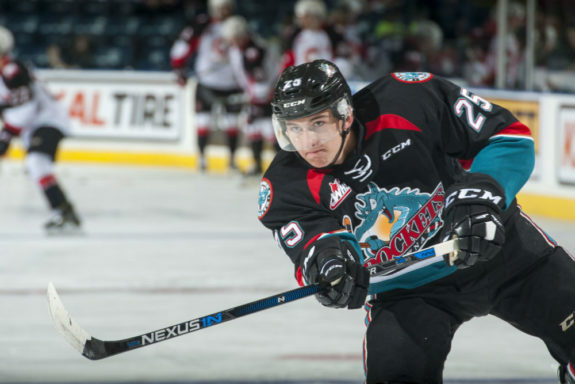 The Rockets have been active in recent years, twice trading their first-round picks for ringers in Reid Gardiner and Leon Draisaitl, who led Kelowna to a league championship and the Memorial Cup final in 2015. This time around, Hamilton didn’t make any big buys but rather a subtle move to acquire the rights of 19-year-old forward Ryan Bowen from Lethbridge. However, Bowen hasn’t reported to Kelowna and plans to play Junior A with the BCHL’s Chilliwack Chiefs — his hometown team that also happens to be hosting the RBC Cup national championship this May. Bowen is the older brother of Kelowna’s top pick in the 2017 bantam draft, Ethan Bowen, who fell to the second round as an NCAA commit but is considered a top-10 talent from that draft class. Kelowna accommodated Belcourt in getting a fresh start with Prince Albert, but otherwise stayed the course in forging ahead with a solid overall roster that features a few top-end talents and two young goaltenders. Hamilton may have balked at the asking prices or simply been outbid in the end, but the Rockets might also be preparing a bid to host the 2020 Memorial Cup and therefore reluctant to part with young roster players or top prospects and even their 2018 draft picks. That announcement could come sooner than later, if it’s coming, but some people in Kelowna and around the league were surprised that Hamilton didn’t make another splash since this will, in all likelihood, be the final WHL season for the Rockets’ three best players in world-junior gold medallists Dillon Dube and Cal Foote and the team’s leading scorer Kole Lind. They are all 19 years old and will be eligible to play pro next season, including the AHL. Cal Foote captains the Kelowna Rockets and anchors their blue line. 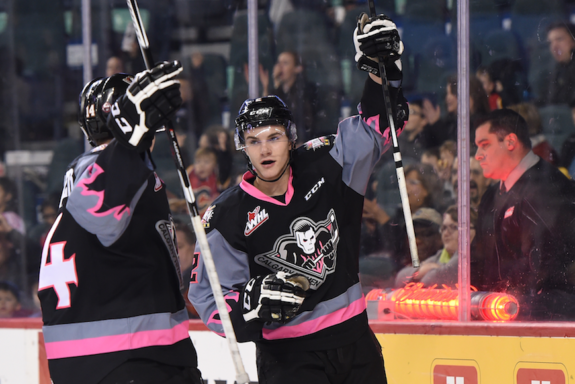 Foote and Dillon Dube will be trying to take their game to another level in the second half after winning gold with Canada at the World Juniors, reminiscent of Tyler Myers and Jamie Benn in 2009 when the Rockets went on to be crowned WHL champions. Knowing that, most assumed Hamilton would be an aggressive buyer again, but maybe he knows better for the future of his franchise. Victoria and Kamloops will be submitting bids for 2020 and Hamilton has expressed interest on Kelowna’s behalf in the local media. Projected roster strength is part of the decision process and hosting that tournament would give Kelowna a one-in-four chance of winning another national championship — something the Rockets were successful in doing on home ice in 2004. Sure, Hamilton could have used some reinforcements for the rest of this season — preferably another top-six forward with size, like Kaspick or Davis Koch, who also went to a division rival in Vancouver — but the Rockets are still the team to beat in B.C., with plenty of playoff experience on their current roster. Remember, sometimes the best moves are the moves a GM doesn’t make, so depending who you ask, Kelowna could be as much of a winner as a loser at this year’s deadline. Saskatoon Blades — This is another tough one that could go either way, winner or loser, but the Blades were sadly sellers again. Colin Priestner can’t be blamed for doing what’s ultimately best, in doing the opposite of Prince Albert, but Saskatoon had played its way into a playoff spot and generated a fair bit of excitement within the city thanks to a seven-game winning streak leading up to the deadline. So it was easy to feel for the fan base when news broke that the Blades were trading away their three best players, in the present, in Hebig, Hájek and Kubic to the rival Pats. But Saskatoon got back Dawson Davidson, flipped Bryan Lockner for proven scorer Max Gerlach from Medicine Hat, and became a buyer of sorts for Florchuk from Victoria. The Blades also got Tyler Brown, for the rest of this season, and Tristen Robins, for the future, so hopefully for Priestner’s sake these deals pay off down the road. Brighter days should be ahead for Saskatoon as long as Kirby Dach and Nolan Maier keep developing into WHL stars. So the Pats just sent a 1st round pick, a 2nd round pick, and two 3rds to Saskatoon. The Blades send a 1st and a 2nd to Medicine Hat. High picks are moving like bubblegum cards this year. Wow.